Norman’s latest Hyde Harrier is called the Jubilee. It was designed to celebrate the 21st anniversary of the first Harrier custom, and the 50th anniversary of the Triumph Bonneville. There are two basic kits, each containing a multitude of parts that you can mix and match. 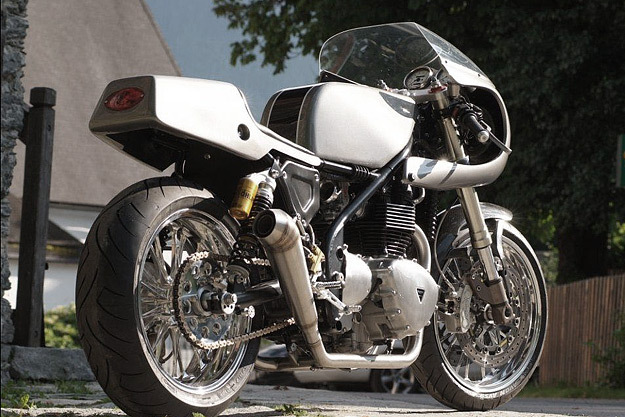 The bike you’re looking at here was built in Switzerland—by Fritz Tschumi of Britalmoto and his son Ivo Tschumi. 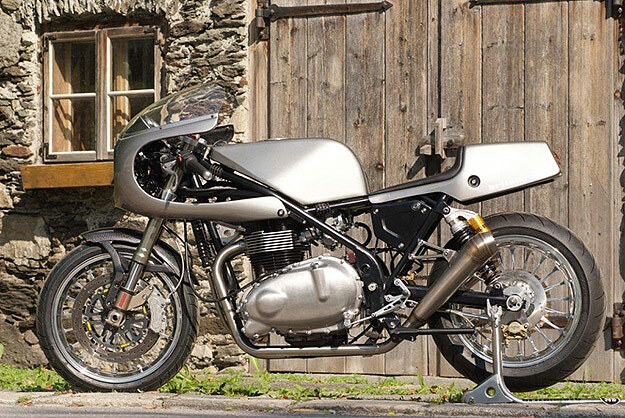 Based just north-west of Zurich, they used only the second Jubilee frame built by race specialists Harris Performance. 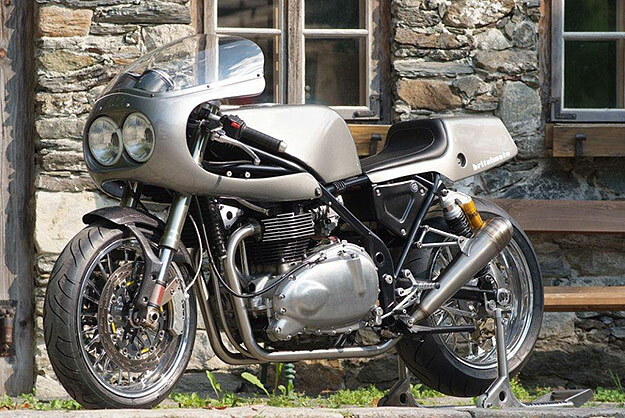 Ivo and his father then installed an engine from a Bonneville T100, modified to Thruxton specification. The exhaust system, footpegs and yokes are Hyde Harrier spec, along with the bodywork. Handling has received close attention: at the front are Showa upside-down forks and the brake cylinder from a Ducati 916. The 20-spoke wheels are from PVM, shod with Avon SP2 Sport Tyres. The brake discs and calipers are from Spiegler, the carbon front fender is from a Ducati Monster, and the rear suspension is Öhlins. It all sounds very good. The result is a low and purposeful-looking bike with a strong retro vibe, but very contemporary performance and reliability. I’d take one in a flash. See more of Ivo Tschumi’s motorcycles here.